This is the last card I’ll be making with my copic airbrush system for a while -because I ran out of compressed air! 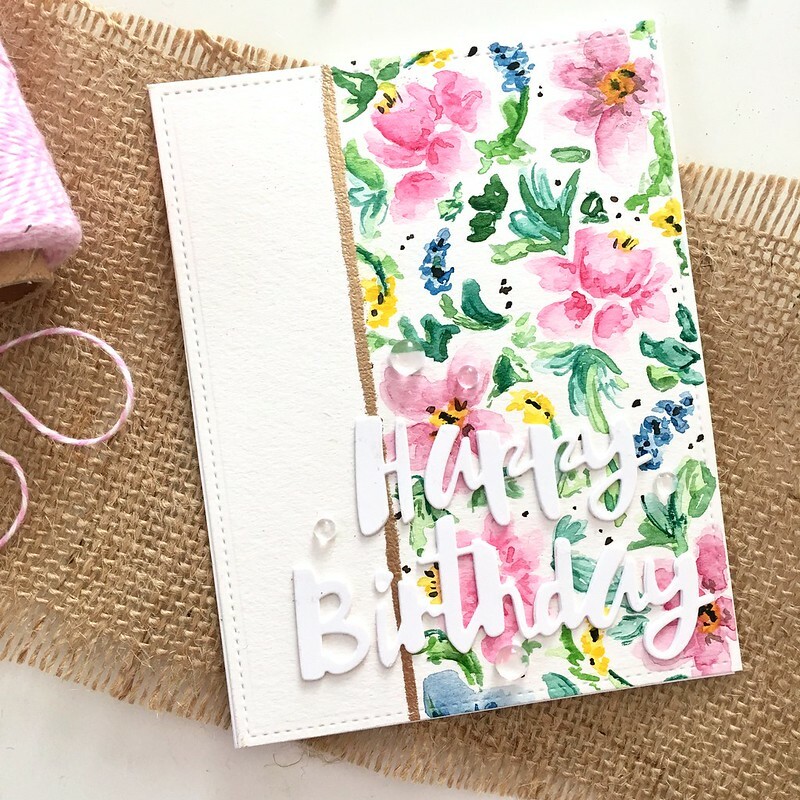 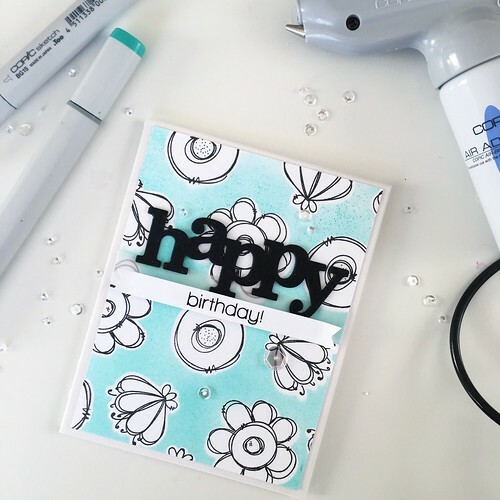 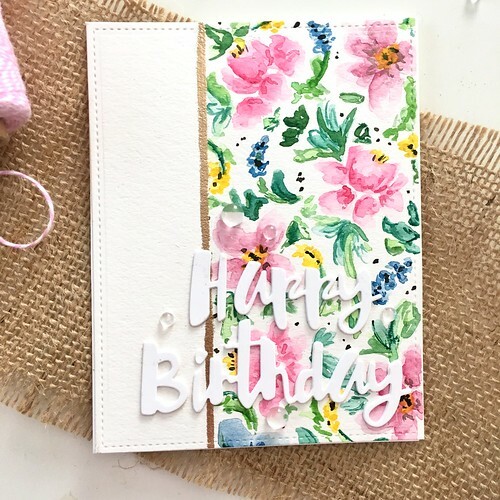 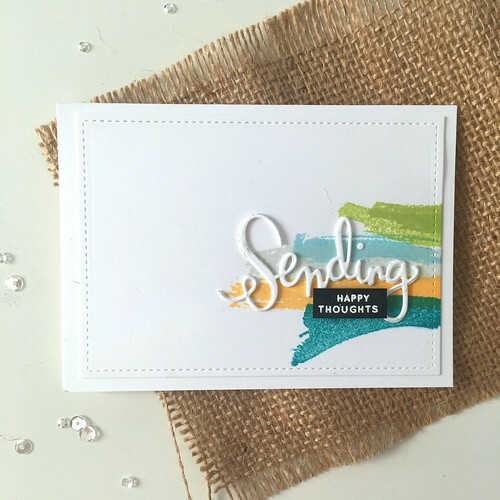 I’ll have to pick up a refill soon, because I love creating cards using this masking & airbrushing technique – especially with this doodle buds set (as you can see here!). 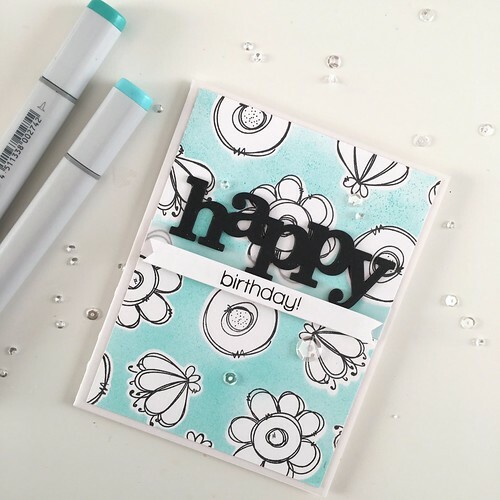 For this card, I first stamped a pattern with several images from the Doodle Buds set using Versafine Onyx Black Ink. I then cut dies from inkadinkadoo making paper using the coordinating dies. 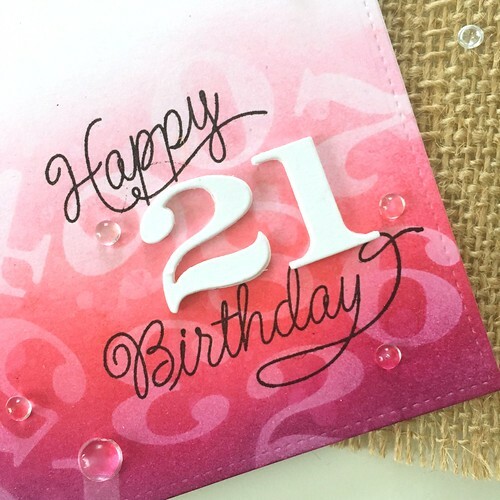 I then loaded my copic airbrush with my BG15 and then my BG13 copic markers and started airbrushing the panel. 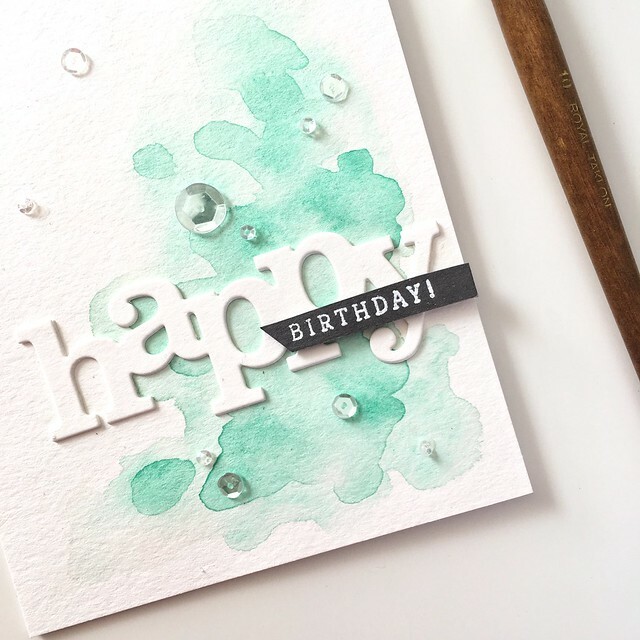 You can see, toward the top, that I was really running out of air, but it kind of created an ombre effect so I’d call that a happy accident! 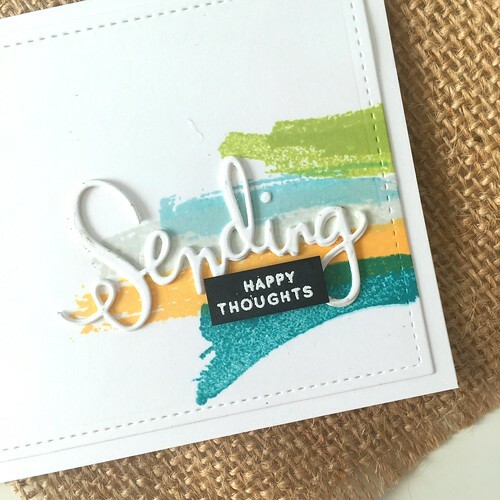 When that was finished, I got to work on the sentiment. 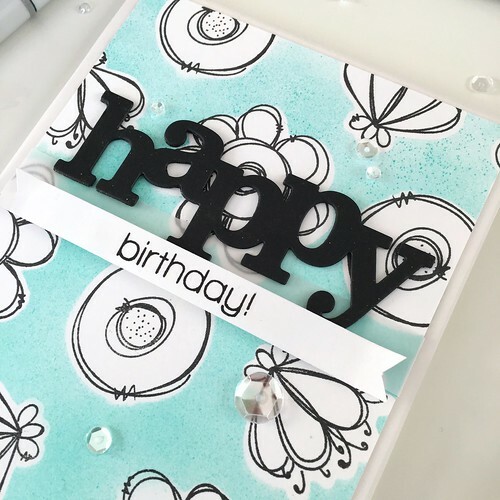 I used the Winnie & Walter In a Word: Happy cutaway die, and cut it from some black card stock several times, then stacked the die cuts on top of each other, gluing each layer together with some spray adhesive. 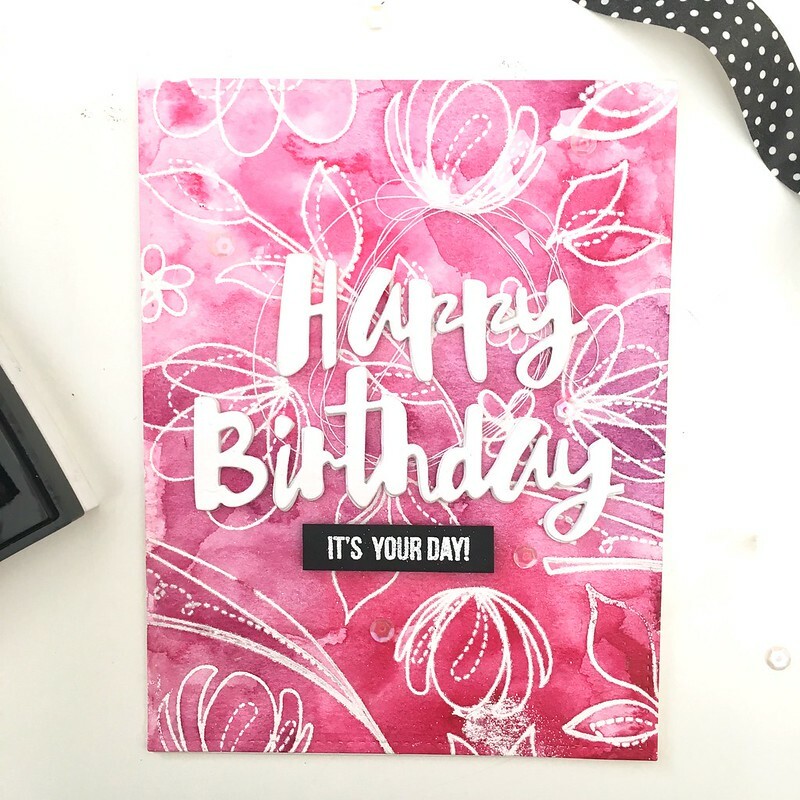 I cut a strip of white paper and cut a notch into each end to create a banner and stamped the word “birthday” with some Onyx Black ink. 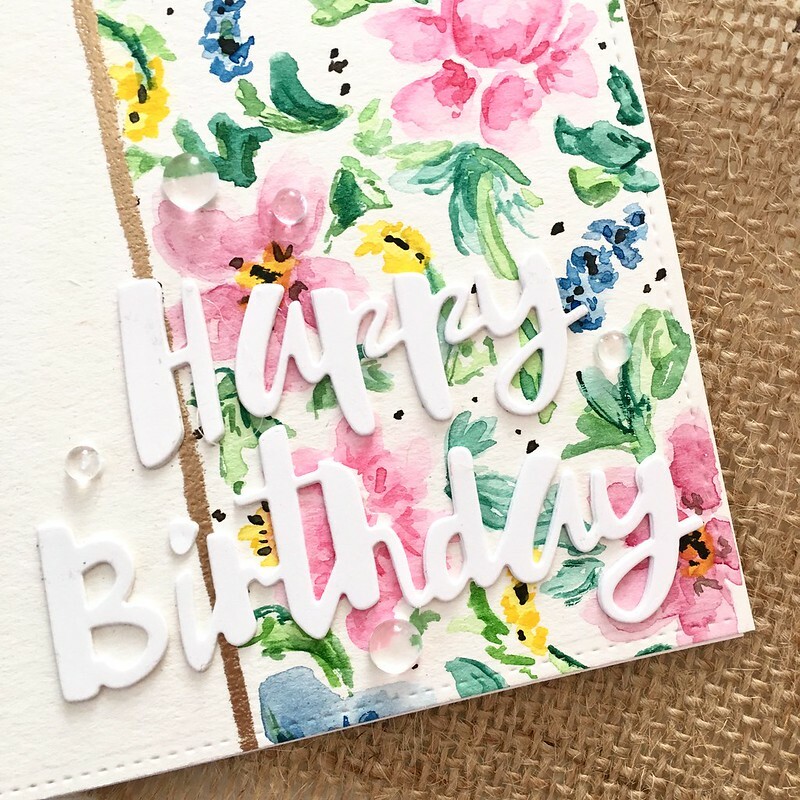 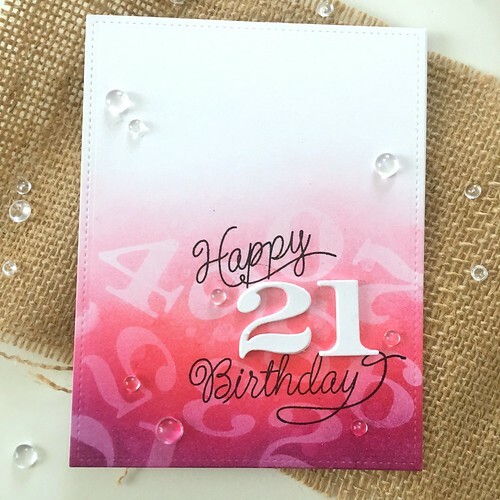 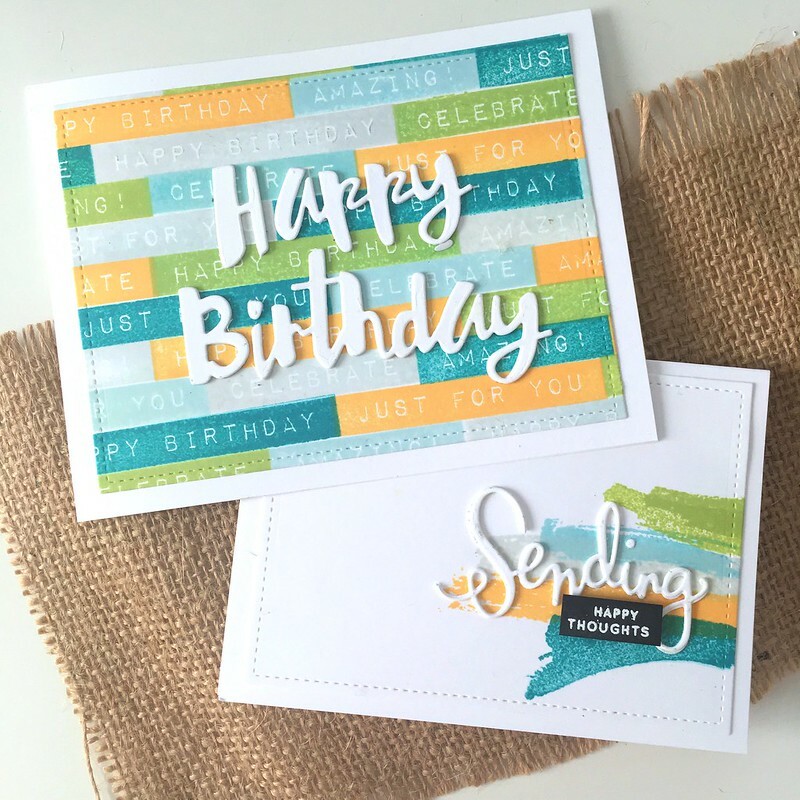 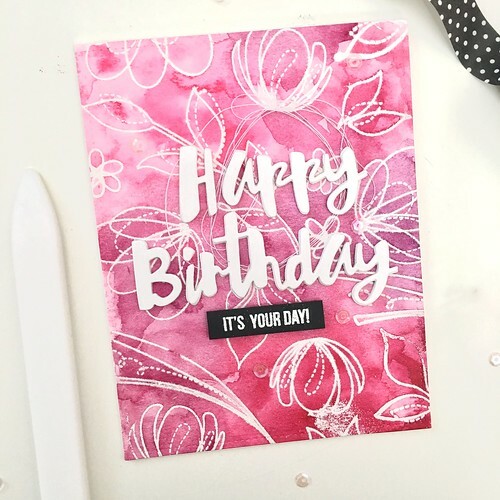 I’m not sure what stamp set that sentiment came from – all I can remember is that I hunted through my stash for quite a while just to find a nice birthday sentiment to match the diecut. 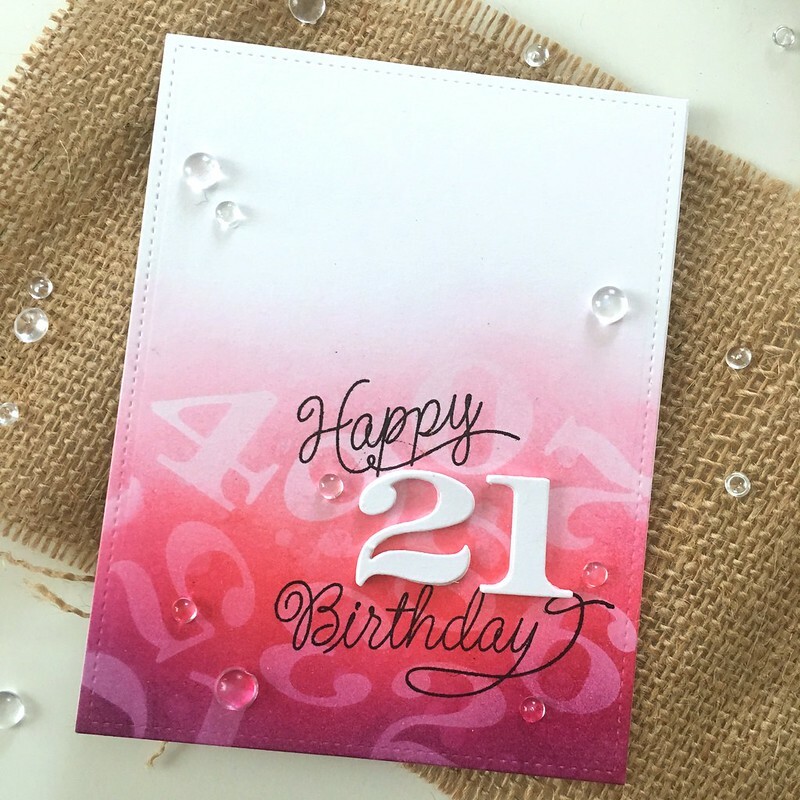 I added a strip of vellum behind the banner before attaching the banner with some foam tape, and then adhered the whole thing to an A2-sized card base and added a few sequins! 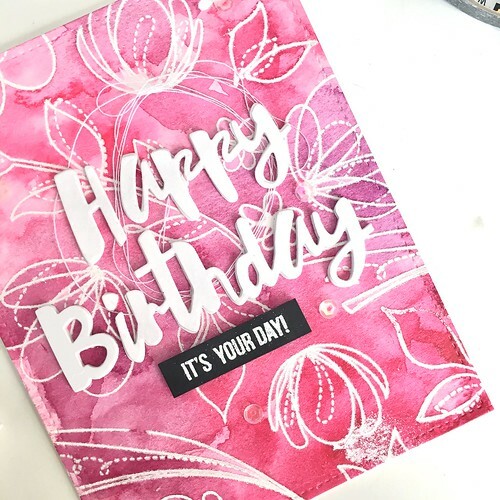 I’ve said it once (probably more than once, actually) and I’ll say it again: you can never have too many birthday cards layin’ around. 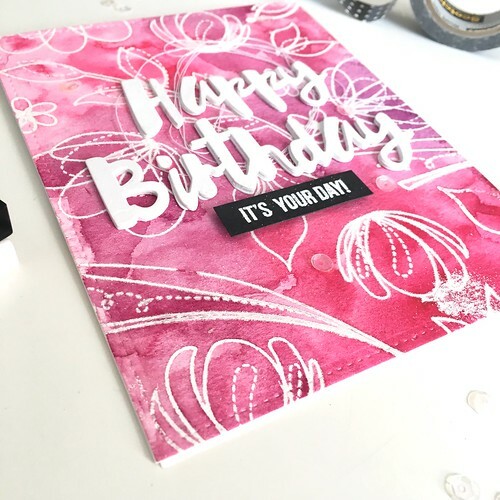 This one features the Simon Says Stamp Painted Happy Birthday wafer die. 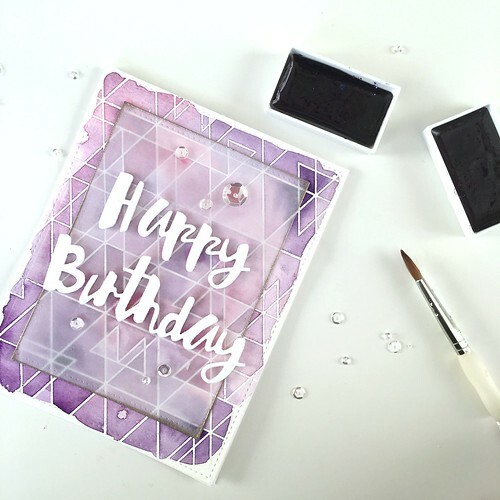 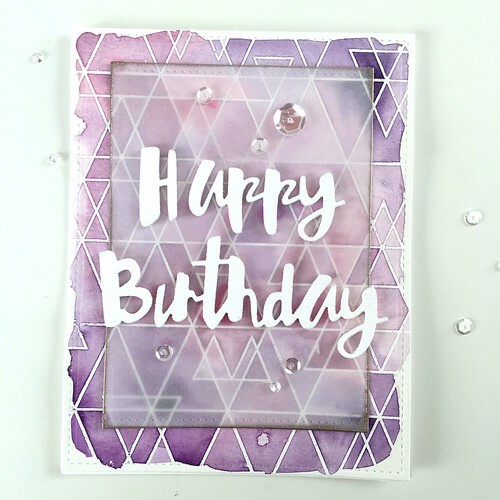 First, I stamped the Abstract Triangles background stamp in Versamark ink onto a watercolor panel and heat embossed it with clear embossing powder. 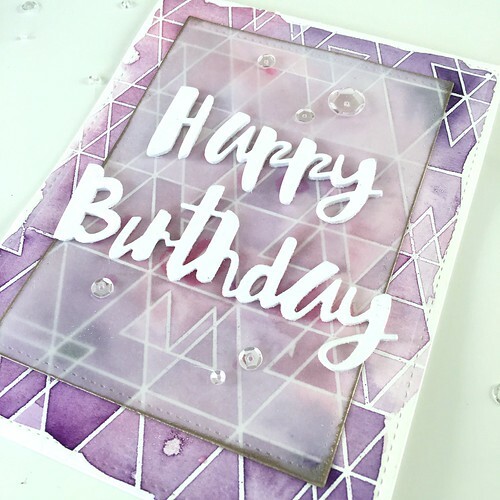 I then added a watercolor wash in various shades of purple over the top. 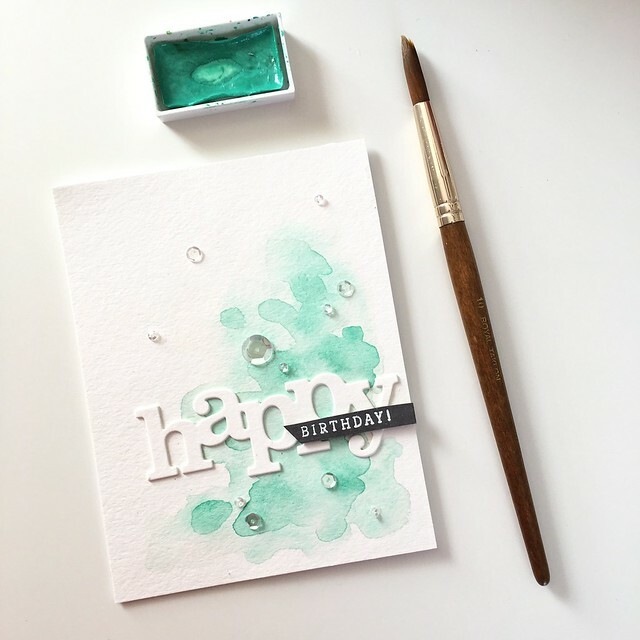 You should all know by now how much I love a good emboss-resist watercolor background! 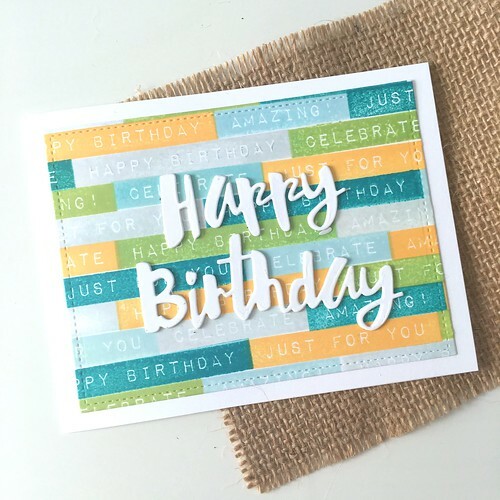 Once the panel was dry, I was about ready to place the Happy Birthday die cuts on top but I felt like they were getting a little bit lost in the lines of the background stamp. 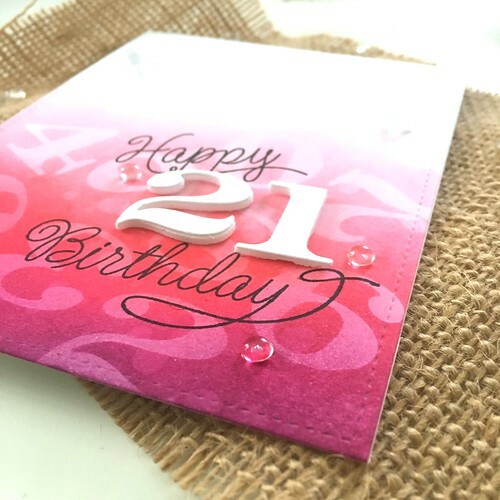 To fix that problem I decided to add a square of vellum between the words and the background layer. I added a little heat embossing (in Liquid Platinum) around the edge of the vellum to give it a bit more separation, and adhered all my layers. 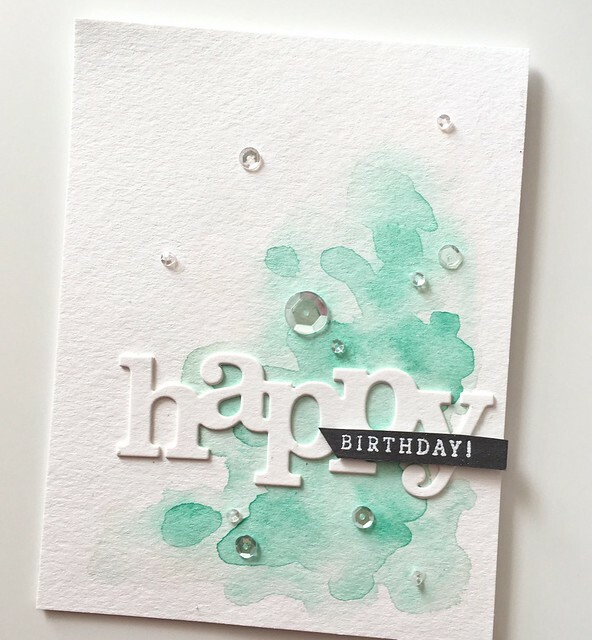 A few clear sequins here and there finished it all off!